We taught for 35 years in Christian colleges as well as in public and Christian elementary schools. 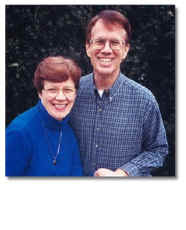 Bonnie taught elementary school as well as teacher education at the college level, and Ron taught psychology at the undergraduate level in college. Our three children are all married and have families of their own. As member care consultants with GO InterNational of Wilmore, KY, we are now retired and, as volunteers, we provide member care for missionaries. We are not licensed health care professionals, but we emphasize care, encouragement, growth, and prevention of problems rather than treatment of severe problems. We provide such care to anyone, anytime, and anywhere at no charge for our time, usually providing our own transportation to the nearest airport and asking that those we are helping provide ground transportation, lodging, and food. Rather than working as professionals for pay, we provide member care as amateurs in the original sense of the word—out of love rather than for money. We have a mailing list of about 145 prayer supporters as well as about 35 financial supporters. We do whatever we can to help missionaries. We do not belong to any sending agency but help others as someone with no official connection to their agency. Listed below are things we are currently doing, but we are always open to new ways to help. In addition to the brochures, e-Books and database on this website we have done (and still do some) of the following. We have two websites, www.missionarycare.com and www.crossculturalworkers.com. Both websites contain brochures and books which people anywhere in the world can visit to read, download, print, copy and distribute the information free of charge to anyone who can use it. www.missionarycare.com freely uses the term “missionary” and is easily found when people search for missionary care. www.crossculturalworkers.com never uses the term “missionary” so that anyone working in a culture where accessing material on missionaries would endanger their ministry can visit freely. Trans World Radio broadcasts in 180 languages to reach people through radio. TWR has begun a daily 15-minute program in English with broadcasts reaching from Central Asia through North Africa, and you can find out more by visiting www.membercareradio.com. TWR is adapting the brochures to a format suitable for broadcast to let Christians working in this area of the world know that they are neither alone nor forgotten. In an effort to decrease attrition, we have participated in the training of new missionaries. We have made presentations on expectations, generational differences, moral purity, and conflict resolution. Of course, during our time at orientation we are available to talk privately with any missionary candidates who want to see us. We present information on various topics to a variety of missionary groups. We have done seminars on third culture kids, leadership, generational differences, conflict, anger, adolescence, maintaining mental and physical health, maintaining sexual purity, and psychology from a Christian perspective. We have made these presentations to groups as varied as the entire missionary force of one agency, missionaries on a field, seminary students, university students, field directors, national pastors, retirees, and appointees. Missionaries have stopped by our home to discuss issues that concern them. We have talked with individuals and couples about a variety of topics ranging from grief to interpersonal relationships to debriefing when they return to the states. These are often people who have met us in larger group settings such as conferences, retreats, orientations, seminars, or perhaps discovered us on our web page. Missionaries on the Field (from Our Home). Missionaries serving on their fields are unable to stop by our home, so we have communicated with them in a variety of ways. Of course, telephone conversations are always helpful, and long distance rates between most countries are now quite reasonable. E-mail is free, but the time between sending a message and receiving a reply may be rather long. Skype is free and instantaneous. At the invitation of missionaries, we visit them on the field to help them cope with various issues. We do this only if everyone involved wants us to come, and we have the blessing of the mission agency. At these times we have talked with individuals, couples, and groups of missionaries. We are not sent by the agency, but go only when invited by the missionaries themselves. Care of Missionaries in a Geographical Area. We want to provide care for missionaries from several different agencies in a given place. We like to go on a regular basis to the same missionaries so that they will get to know us and feel free to talk with us, rather than just going to help in a crisis situation. We visit have visited Bolivia whenever invited, usually talking with 30-35 missionaries from about five different mission agencies each time. We facilitate reentry retreats for missionaries in transition as they return to the USA. This includes a group debriefing as we talk for two days about where they have been, are now, and are going. Since we live near a college that has a rather large number of TCKs, we were very involved with them while we were teaching at the college. Of course, we are unable to keep up the same active relationship as when teaching there. However, we do let them know that we are available to help them however we can, and they contact us for everything from taxes to borrowing things to personal problems. As we entered into our 70s, we have done much less traveling, but still meet with people in the USA and participate in conferences and retreats, as well as consulting with mission agencies. We still write brochures and books.